Congratulations are in order! 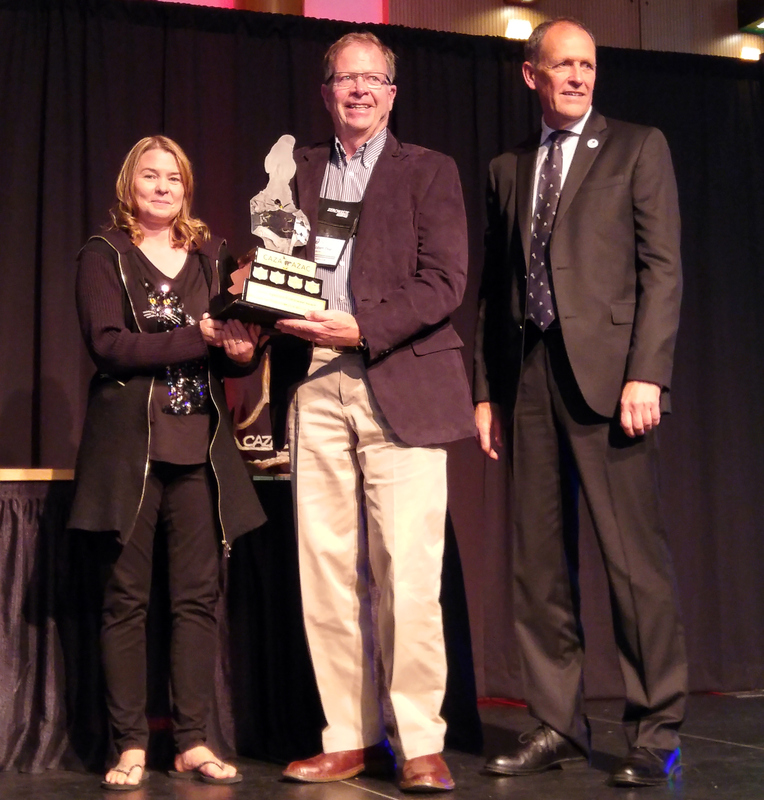 Our Devonian Wildlife Conservation Center Supervisor, Rick Wenman, was awarded the prestigious 2016 Zoo and Aquarium Professional Award from Canadian Accredited Zoos and Aquariums. Since 1979, Rick has been making the zoo a better place, when he was first hired as a labourer. Always interested in animals, Rick moved from Ontario to Calgary and began working for the Calgary Humane Society. Once he transitioned to the zoo, he quickly rose from a labourer to an apprentice, and his zoo career took off. After almost a decade of working on St. Patrick’s island, in 1988 he made the move to the Devonian Wildlife Conservation Center (DWCC) near De Winton to continue his zookeeping work – with a new conservation focus. Spending so much time out at the DWCC, Rick decided to move and live there on-site. Always on grounds, his position and those of his colleagues are different that of zookeepers on-site in the city. 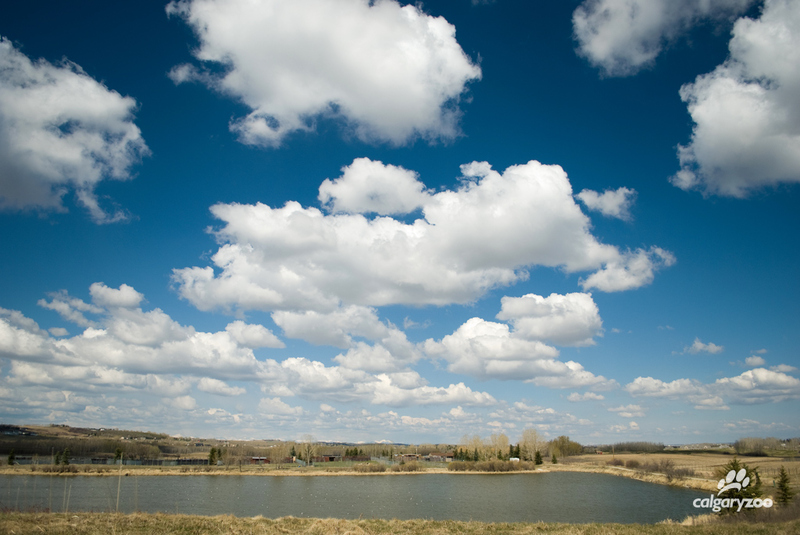 The Devonian Wildlife Conservation Center is half a square mile or 320 acres, including a 30 acre pond that is a hotspot for frogs and migratory birds. This big space was originally used for accredited breeding of hoof stock like moose and dahl sheep, and he estimates that most of those animals found in facilities in North America and Europe are descendants from Calgary Zoo animals. The DWCC transitioned from that practice to caring for specific endangered species, like the iconic whooping crane in the early 1990’s. After starting with cranes, the DWCC has taken on caring for Vancouver Island marmots, Przewalski’s wild horses, as well as begun a head start burrowing owl program. The focus with most of these species is reintroduction- caring for animals in order to return them to the wild and bolster those natural populations. When the zoo started helping with the Vancouver Island marmots there were fewer than 50 left, and now the species is up to 400 in number! To him, this emphasizes the important work being done and why zoos should continue to prioritize their conservation efforts. A story that Rick shares, highlights the zoo’s impact on the Vancouver Island marmot population. 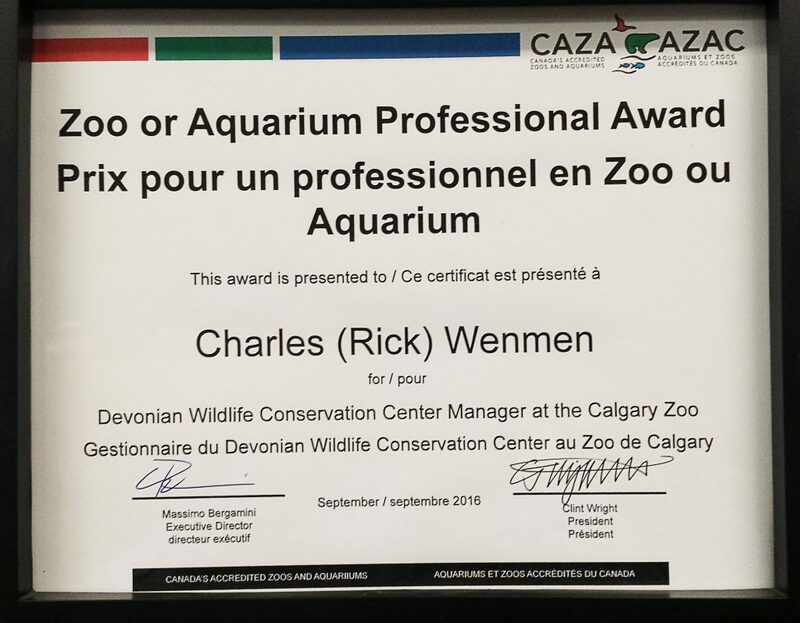 The Zoo or Aquarium Professional Award given to Rick Wenmen from CAZA. Zoo animal care staff members Colleen Baird and Bob Peel accept Rick Wenmen’s CAZA award on his behalf. Learn more about the zoo’s conservation work here and meet other amazing zookeepers in our yearly Zookeeper Week series.